Got White Canvas Syndrome? | Tezi Mag ~ Grab A Coffee, Read, Relax, Enjoy! For a writer there is nothing worse than white paper syndrome; for an artist there is indeed an equal frustration – White Canvas Syndrome! It is a malady we artists all suffer on occasion and when it strikes it surely puts one at a complete and disheartening loss. Motivation flies south for the winter, swiftly ensued by any wisp of desire left in one to do anything at all, let alone begin a new artwork! For this reason alone it is best to never even ponder an attempt at working cold onto a blank canvas. Depending on the mood of the day, the atmosphere, the music playing, and of course the availability of remaining paint, choose an acrylic colour, or any combination of acrylic colours, grab a wonderfully over-sized bucket of white or black gesso and slap great wads of each onto an ice-cream lid. Take a medium to large sized house-painting brush, dip it first in the gesso, then lightly on each tip into each of the colours you have selected and let loose with wild swathes of randomly placed brush marks all over the canvas. Don’t be precious about it and don’t stint on the amount of paint you use. Keep splatting until the canvas is completely covered in a lively layer of swirls and patterned streaks which in themselves will have become a wonderful work of primeval art. The priming of your canvas is now complete and the uninspiring white canvas is no more. Now, make a hot chocolate, pour a glass of something warming, stand back, wait and watch while the image you wish to place upon this freshly enlivened canvas begins to broil and unfold in the depths of your creative juices! Now get painting! Below is an image of my own latest work in progress, done using the technique outlined above just yesterday. This is the preliminary sketch on primed canvas for ‘Tendrils’ #11 (100 x 80 cm), which will be painted in oils, in the same manner as the other 10 in the series. I like to sketch an image onto the canvas before painting, particularly for figure painting, which I am quite fussy about when it comes to detail. This work I sketched in pastel, though I usually use watercolour pencil – both allowing for easy corrections and pre-painting clean-up without making a mess of your freshly primed canvas. 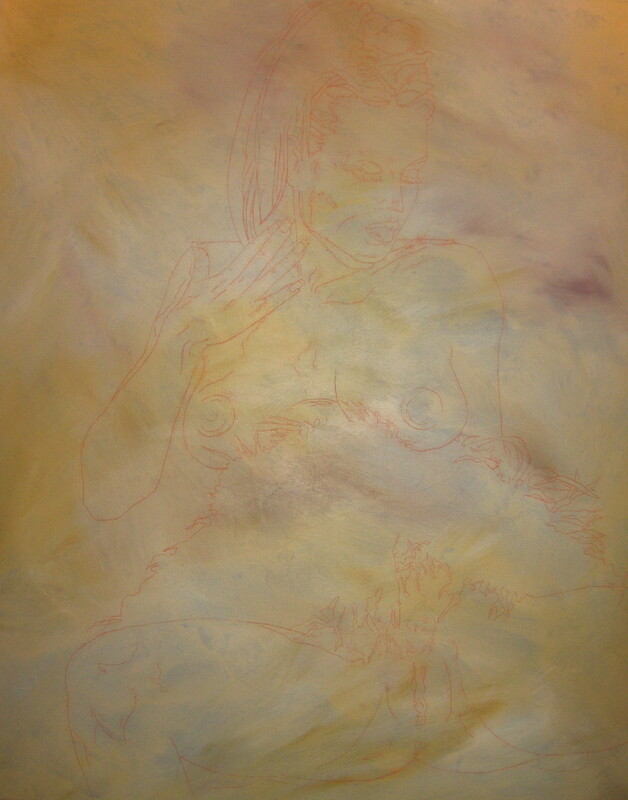 I deliberately omit any shadows or highlights at this stage in the work, except for perhaps a few basic indicator lines of shadow, leaving only clearly defined outlines and details which dissolve and disappear nicely as the paint is applied. Keep splashing & stay inspired! Yes indeed :). Thanks for dropping in! Wow, certainly great information. How will I find this RSS? Simply click on subscribe me (top right) or click on the rss feed buttons (lower right hand menu column of page). Cheers! LOL. I searched this on the internet just because my art teacher made it up but, Look at that! You also made it up too.White canvas syndrome. I hate it. Haha! It’s an AGE OLD problem for both artists and writers! White page syndrome for writers, white canvas syndrome for artists! The trick with it is always JUST START PAINTING. Put a splat on your page with paint, draw a line – it doesn’t matter – break the white, make that mark! (Or – do what I do – paint the entire canvas first and see what imagery pops out of the mix of undercoat colours) The second trick is – NEVER be afraid of stuffing it up – don’t NOT do something because you’re afraid it won’t work. There are no such things as bad painting or drawing marks – just some marks that work and some that don’t; the ones that don’t – you expand into something that does! Always work INTO a mistake – turn it into something. Don’t erase – you will become an obsessive perfectionist that constantly erases and reworks everything. You will amazed what can come out sometimes if you go WITH a mistake and see what you can make with it. Be bold and confident and your works will shine – shy away from the canvas – and you will never get a piece finished to your satisfaction – ever! Pingback: White Canvas Syndrome – Uh huh! « TE-ZINE ~ Grab a coffee, read, relax & enjoy! Thanks! About two years, I think? 🙂 A bit slack of late though! Cheers. Don’t we all lol! Hi to all, it’s in fact a fastidious for me to pay a quick visit this site, it consists of precious Information. That is a very smartly written article. I will be sure to bookmark it and come back to read extra of your helpful information. Hi Sonja, This is not a paid topic. I write all my own articles and TEZINE is an independent ezine. Cheers! Cheers, thanks so much. I get most of my info out of my head – researched in the old fashioned manner (books – not blogs or internet) – or from personal experience. Life is a pool of inspiration in herself! Sorry mate, no idea. Perhaps contact wordpress themselves to find out? An outstanding share! I’ve just forwarded this onto a friend who has been doing a little research on this. And he in fact bought me breakfast because I discovered it for him… lol. So allow me to reword this…. Thank YOU for the meal!! But yeah, thanx for spending time to discuss this subject here on your web site. Sorry, I’ve no idea! -? Best to ask wordpress themselves about that one! Cheers Luciana. If you like to chat about link exchange, just contact me via the contact page on this blog. Thanks, Tahala. It’s in point of fact a great and helpful piece of info. I’m satisfied that you simply shared this helpful information with us. site? I’m getting fed up of WordPress because I’ve had issues with hackers and I’m looking at options for another platform. I would be fantastic if you could point me in the direction of a good platform. but I to find this topic to be really one thing which I feel I might never understand. me. I’m having a look forward to your next publish, I will attempt to get the grasp of it! an extremely smartly written article. I’ll make sure to bookmark it and come back to learn more of your useful information. Thanks for the post. I will definitely return. assert it. You’re making it entertaining and you still care for to keep it wise. I cant wait to learn much more from you. This is really a tremendous website. Hi! You don’t need any coding experience to use wordpress. None whatsoever. Just click ‘sign up’, choose a name for your blog and it will guide you through the steps from there. You can select a free blog or opt to purchase the blog and turn it into a website for around $18-$25. It’s easy once you get the hang of it. Let me know if you’ve any probs/queries. Happy to help. Thanks mate, much appreciated. Love your enthusiasm! Thanks kindly! Look forward to you coming back again! I use wordpress. Beep.com is another good site. Very simple. They give you a free blog and/or website with the same name, alternatively on the website you can insert a blog which is handy. Highly recommend them. Unlimited links and you can use referral/affiliate links which you can’t use on a free wordpress site. Hope that helps. This much I know… lol! ? Thanks for the feedback Olive! Much appreciated! LOL! It’s a play on words. White paper syndrome is something suffered by writers when they can’t think of what to write and sit staring at the blank page in front of them. Artists sometimes have the same problem when faced with a blank canvas!